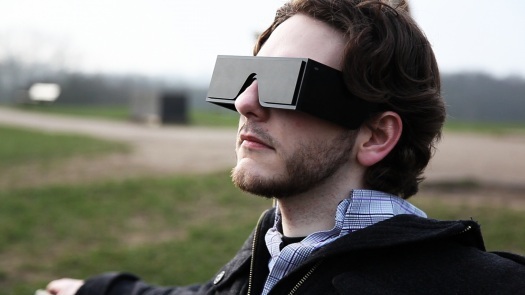 Superflux headset to enable prosthetic vision. The Future-Present is something that once one has begun to notice it, it becomes very difficult to not see. This visual pattern of our conception of the future has the occult symbolism of apophenia, an illusion of perception generated as glitching artifact by the same non-illusory means by which we perceive reality. The shape of history projected forward in time looms out in the shape of a monster from patterns of moss on our architecture, and as a prophet from coffee stains on news magazines. Our imagination builds reality both forward and backward in time, as our vision builds reality on both isomorphic sides of the mirror. Our speculative thought catalogs these alternate realities, and we attach them to ourselves like equipment strapped to the stomach of a soldier, and we drag them along with us as we crawl across the surface of the earth, dodging death. Or so we dream, as we let our eyes slowly unfocus, gazing at our liquid crystal screens. The Future-Present hangs heavy with acquired schematization, grows thickly in the rhizomatics of our mental constructs, and with this decaying biomass, lubricates the sliding transmission of our worldviews. But while the implications of the Future-Present for philosophical theories that deploy such semiotic hardware are important, there is a complex material realm of the Future-Present that should not be ignored. Regardless of what sort of opaque, nebulous terms we develop for the clouds in our temporal vision, they have material form with which we will collide with if we don’t watch where we are going. The gears of the mechanisms are sharp, and the metabolized exertions to avoid injury on the cutting edge are chemically taxing. This is not simply a matter of seeing correctly and avoiding illusion. The illusions have important meanings. Patterns are the visual boundaries of underlying systems. 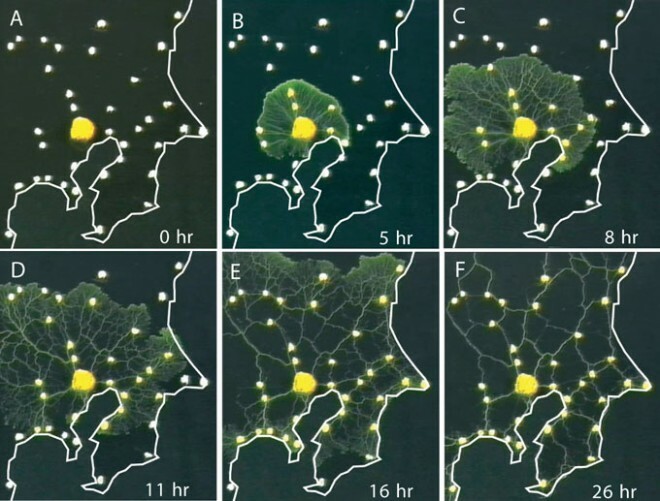 When a slime mold grows into nearly the exact same shape as the Tokyo rail system, this is not a random coincidence. These systems are analogous, because they both function on the basis of economizing transportation of resources through space for maximum efficiency. The similarity in shape is what we see, but the choice of one particular pathway over another by the system itself is the functional pattern. Visually apprehending the pattern is often more difficult than simply traversing it intact. Especially when two complex systems are interacting, it is difficult to map a representational pattern of differing dimensions so that we can see what’s going on. We can’t always build a stronger microscope, or find a new aspect to tag with a radioisotope, so we can see the glowing diffusion of the systems we control flowing before us on a monitor. This is an inherent difficulty with the Future-Present--it attempts to create a somewhat unified picture of many systems, each developing their pattern and interacting. And, it must do so with the knowledge that this is a flattened projection, as a simplification of the evolving temporal axis. The unfolding of history is a system interacting with our virtualization of it. Think of it this way: we are playing a video game, the goal of which is to program the video game, at the same time as it is designing and building the hardware of the game system using only that hardware. We are breaking and changing the system from the inside, but if too many wires are cut, we will lose the means by which we are working. “Meta” scarcely begins to grasp the problem. We need better verbal tools to even begin talking about what we are trying to interact with the world via virtual projection. Thankfully, futuristic speculative-fiction-like technology has just such a verbal tool waiting for us. That is to say, the history of futuristic speculative-fiction technology, because this archetype of the Future-Present is over fifty years old. In 1960 these two scientists were trying to develop ways to adapt humans to space travel rather than adapt space to the human body. A cyborg is the extension of seemingly separate complex systems into a well-regulated single system. Easier said than done, of course— and this is why humans still breathe oxygen through their lungs and eat food with their mouth when they go into space, as they do on earth. But that isn’t to say that the problem of how to transport breathable air into space isn’t a problem that cannot be routed around, by re-engineering the human respiratory system or heavily integrating it with technological systems. Science-fiction, especially in cinema, tends to think about cyborgs as the integration of the human body with weapon systems, or anti-humanist, cold, calculating logic circuits. But we are integrating complex systems into homeostatic interaction with our human body all the time. We are developing our personalities to function within social media systems; our bodies’ health limitations are being modified in conjunction with elaborate pharmacological regimens; and for aesthetic purposes we alter the visual qualities of our flesh to make them appear different, or perhaps, more similar. The more that we do this sort of thing, the more we consciously think about it. Like the Future-Present, the Cyborg conflates our understanding the interrelation of the possible and the impossible. We re-conceptualize our bodies and beings as “exogenously extended organizational complex functioning”, so that we can figure out how and where to attach these components, and how to think about the process of doing so. We try to understand what we are doing while we do it, even while the eventual result of our experiment is unknown. 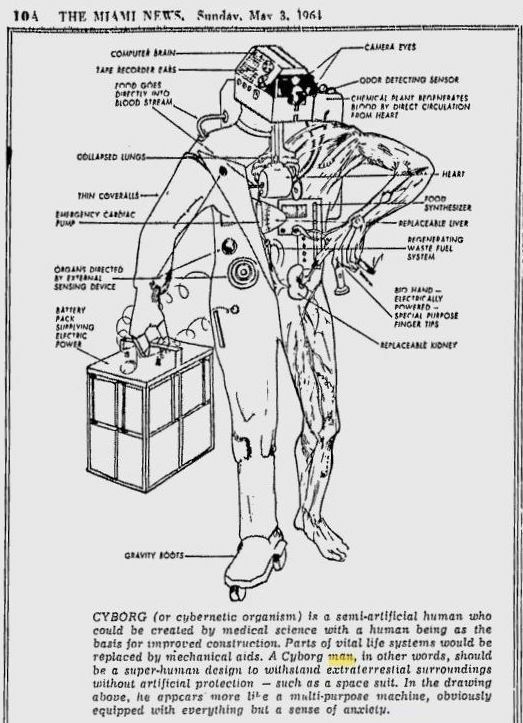 The concept of the cyborg is about breaking the conceptual walls between systems. It is the archetype of integration--both material and idealistic. The cyborg is a combination of robotics technology, and SF imagination. It is an ideal manifold of the way things are “supposed” to work, and the way we want them to work. It is a mashup of fixing and breaking. The test pilot of the Cold War, the phone phreak of late 20th Century mythos, and the contemporary Arduino hacker all find their spirit animals in the cyborg. They all concern themselves with thinking about the Future-Present, at the same time was they evolve the Future-Present. They break into the Future-Present, reverse engineer it, and short circuit its current functionality in order to build new homeostatic systems from the salvaged parts, and to discover the new boundaries that these evolutions bring about. This point of these archetypes is that they might help us break down the conceptual wall between the technology and the way we think about the technology. I hack ideas, but my Future-Present informants hack technology. From our conversations, I got a sense of how the ideal and material planes form a cyborg-like relationship via their interaction. Much of being a good programmer is about mindset, about the mental tools you bring to the table. For instance, how much computer science do you know, without getting bogged down in it? The set of things that you use in the building of technology, and the set of things that you use when you dream up how it could work, they are pretty distinct. Lots of people spew BS about innovation: how do you do it, and how do you bottle it. I’m a systems thinking and designer, and that’s the tool kit I use when working in the world. It’s good to know the shape of the possible, but that’s not enough. You need to know your tools and your context, and how those relate. You need to know social context, as it relates to things you are trying to do or change. The whole of the “way things work”. One thing I find useful is how large, distributed structures of similar or dissimilar parts interact with each other, how they fail. One small intervention could cause the larger system to shift in an interesting way. Everyone has a different approach to this. Some people sit down with one idea, and beat on it for decades. You need both. Innovation comes from a lot of work. The mechanic doesn’t need formal training, but has everything laid out in front of him or her. What you see is what you got. Material things are hard--take flint-knapping for instance, which is very difficult to do well. But it’s all right there, it’s not hidden. There are things that we can take agency over, even if we don’t know how to do it yet. We simply need to have the desire to do so. The tough part about bringing women into the hacker community is that they’ve been taught not to touch certain technologies. They don’t have the “sit down and play” worldview, that permission to start playing. I think that’s really important. I would imagine that most who work with ideas or the materials of the Future-Present would agree with Eleanor— the way to hack into it is to bring a good set of tools to the table, but then to sit down at the table, and start messing around. One will have difficulties customizing their own cyborg-historical system, if one isn’t prepared to start cutting and welding. The reason that innovation is innovative is that it cannot be found on a shelf. There is no recipe for creativity, and there is no single catalyst for the future. But with a good system of visualizing the material, a good system of working with the material, and these two systems up and running simultaneously, that is about as much of a work station as anyone could hope to have. There is a subset of things that you can tweak, not all things. There are things that are not amenable to tweaking, to working with, or are less interesting. It’s the difference between doing chemistry at home, versus high energy physics. It’s hard to do physics, period, you don’t have access to the tools. The web went through this evolution. The Arduino is bringing physical electronics to this tweakable space. You don’t have to design the chip, and you now have a platform. The appeal of drones is similar: you could buy one off the shelf, and play with it. Drones are fundamentally different than bombers in this way. You can’t buy a bomber... but with drones you have essentially the same tech as the military. It’s the same thing with websites, you could have the same level of tech in a website as the Department of Defense. There is an asymmetry with certain technologies. As well, there is an element of backlash to it. You see this with the punk movement in music, a moving away from virtuosity. It’s not so much about innovation in technology, as it’s about engagement--emotional engagement, and engagement with the world at large. There’s a blog piece by Alex Bayley about the idea of knitting as code. Knitting patterns are basically a set of iterations. To the untrained eye it looks like code. There are a lot of repeats, row numbers. The point of the article was that it looks like coding to someone who doesn’t know anything about knitting. But she talked about how you could talk about knitting as code in using knitting code bases that already exist and modifying that code base to your purposes. This allows you to knit new things. This is an example of tweaking through craft--you could use the off the shelf patterns, but you could hack it to create what doesn’t exist before. I knit, but I’m not a hacker when I knit. I’m just compiling the code. This is not dissimilar from Sol LeWitt’s work. He creates the instructions, and then someone else ‘compiles’ the instructions to create the piece. What is funny is the fetishization of that process. I feel the whole point of conceptual art is to hack and to patch. Is the Future-Present, like the Arduino, a platform for hacking the future? There are similarities, but also differences. If the archetypes of the Future-Present could affect the way we view technological change as simply and directly as a servomotor, that would be magnificent. But the truth is that these archetypes and the notion of “hacking” future history is something more obscure in function. There is an asymmetry to the interaction of material and ideal systems that we are exploring— writers will never be able to use drones in the same way that programmers can. But who earns more punk cred? Cyberpunks who can hack the device, or the speculative fiction and fashion producers that turn the device into a symbol? But fetishizing the integrity of the platform, by securing the shiny bezel on the outside of these devices against hacker intrusion, both mechanisms are isolated from evolution. 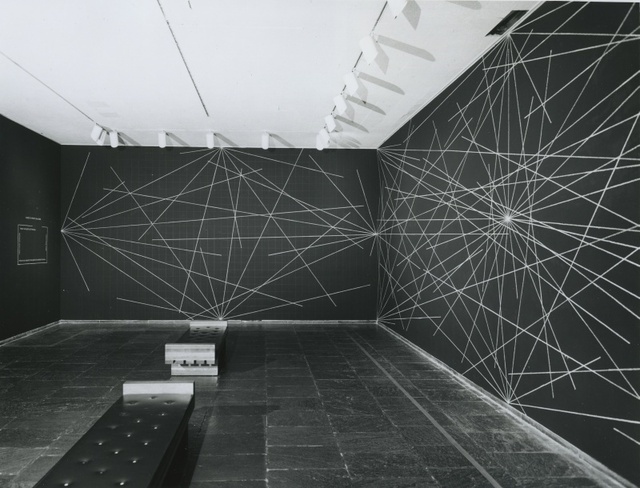 Sol LeWitt created artwork instructions that are certified pieces of intellectual property, owned by galleries, museums, and private collectors. Securing work into property is a good way to safeguard exchange value— or in the case of the military-industrial complex, safeguarding access, at least for a time. Certain systems are by their nature harder to work with, and don’t avail themselves to experimentation. But artificially locking down technology or concepts doesn’t allow those systems to graft onto others. Interaction between systems is what is causes them grow. That means by which the material and ideal platforms function differ, but insofar as both are functional limitations of conceptual interaction, they are similar. I would have to assume that for those interacting directly with the technology, there’s a tension between the feasibility of design and what you think people might want to see: what’s in the zeitgeist. Your own design skills, the tech, and the materials only allow you to do certain things. People might be talking about sending 3D printers to the moon. That’s an exciting science-fiction principle, but is that actually possible? I have to assume there’s a frustrating, but very different energy that comes from the material design side of things. Though many times I’ll have a really speculative piece on BLDGBLOG and someone will leave a really perceptive comment about the material limitations of the technology. Some people are very interested in dealing with these limitations. But what I like is talking about the fictional narrative and speculating with the possibilities. How might you usher in a different future? The very act of design is thinking about an alternate future, and whether you do that with narrative or with tinkering with nuts and bolts is more about your background. I come from a humanities background. Maybe if writers grew up in different circumstances, they would be tinkering with drones. Just because the way that we interact with systems and cause them to interact with each other is conceptually similar to a cyborg, does not mean that suddenly our understanding is an omniscient killbot, that can hunt its enemies across time and survive the vacuum of space. As much as we let creativity flow, we are constrained by a reality principle. Cyborgs, like the Future-Present, must live on earth, and are not free to roam the speculative realms untethered. There is a grounding in science to both of these that enables their speculation. This is not an arbitrary boundary, but the mean by which the functionality is fueled. It is a bit startling when the patterns we think might be mere illusions are revealed as the very substance of reality. What was once mere speculative fiction becomes a historical concept for understanding that historical development. Ecstatic visions not only solidify, but turn out to be the entities conducting our job interviews. But we are beginning to develop the tool kit for such uncertain professions, even if we aren’t sure what we are making. I enjoyed the scope of this thought provoking piece. Excellent back up quotes from Eleanor and Deb also. I was most curious about this assertion: "But we are integrating complex systems into homeostatic interaction with our human body all the time". From a point of view, I guess our interior self, our bodies homeostasis may appear to be perpetuated with minimal perturbation. But my hunch is that no external complex system could be integrated in the manner you describe without some trace or residue inhering. I feel inclined to disagree with your stance on patterns: "Patterns are the visual boundaries of underlying systems." I tend to think that patterns are only as powerful as the truth that is subsequently made from them. I'm reading a privilege on behalf of the internal actor within these systems. Was this deliberate, and do you feel it is accurate?